I have a S3 JSON file that I need to access from a Xamarin Forms mobile application. My S3 resource is not a public resource, its protected and requires credentials to be able to access it. There is another Windows Desktop application that will upload this file periodically, and the mobile app must only have read only access to the file. Note: no special authentication is required to access public (unprotected) S3 files. The AWS portal offers a free plan to store up to 5GB of storage for 12 months. After that it'll depend on number of requests and storage size. For me, for a 100Kb file accessed maybe 100 times a month, it'll be approximately 5 cents per month based on the calculator. To access protected (non-public) data in S3 you'll need to set up users and access tokens. Once this policy is attached, user will have read only access to everything stored in the S3 account. The next step is to generate an access token. This is done with the Security Credentials tab. Again this is very simple so not much detail here. There are a couple of basics to be aware of. You first choose where your data is stored geographically (ie Sydney, Oregon, Tokyo to name a few) and is not mirrored between regions (but this can be set up). Data is stored inside "Buckets" - think folder. Although you can't nest. Files can then be uploaded and accessed inside these buckets. The red line is obscuring my chosen bucket name (because its top secret), and you can see the file name shown in the list. Writing a C# desktop application is pretty easy with the AWS SDK, certainly no challenges. storageKeyId is the access token generated earlier. AWS IAM calls this the Access Key ID. storageSecret is the access token secret generated ealier. AWS IAM calls this the Secret Access Key. The bad news, is that this doesn't work in Xamarin, as the AWS SDK has an incomplete portable class library port. If you try to use the SDK in a PCL or a Xamarin native project you will get NotImplementedExceptions. There's a couple of issues with this however. At the time of writing the docs are a little out of date and don't match the Cognito console web site, which makes things a little difficult to follow. (I have sent them feedback on this issue). Also, more importantly, AWS Cognito is currently only available in the US East (N. Virginia), EU (Ireland), and Asia Pacific (Tokyo) regions. This doesn't work for me as I need to use AWS Sydney. Fortunately, AWS does have some comprehensive instructions how to craft and pass in the right HTTP headers so you can do everything yourself. Also, its worth noting that Postman supports AWS authentication natively which is pretty handy for testing and to see example requests. This approach, I think, has a couple of redeeming attributes: Its lightweight, and no extra dependencies are required. Its also easy to take the headers and use your favourite REST testing tool. var requestPayloadHash = CalculateHash(string.Empty); // My request, as its a GET, will be empty, so hash an empty string. Yep thats correct. // Note that Content-Type cannot be added to GET request using HttpClient - using Content-Type does seem to be common in examples found on the web including GET requests. The AWS Access Key and its Secret are passed into the function. I also pass in a IHashingAlgorithm. While .NET does have the correct SHA hashing classes these classes are not available in PCL. However they are available in Mono, so using Dependency Injection, you can defer the hashing to the iOS or Android projects. //Note: System.Security.Cryptography is not PCL compliant and cannot be used in any PCL. But, it can be used from the Android project because a port of it is available in Mono. My team and I are building a Xamarin Forms mobile application that includes iOS and Android projects. I've set up automated CI builds and I've created some custom build configurations for CI and Production (Store) builds. 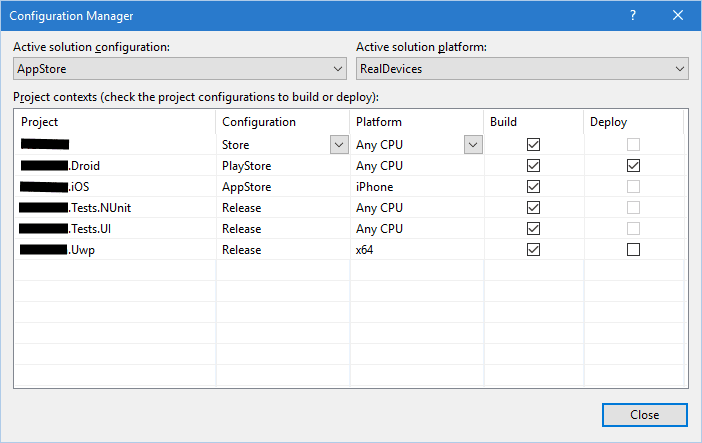 The idea is to use one solution level build configuration that configures both iOS and Android projects appropriately with one build script. (The first project is the PCL which simply the App name with no suffix). 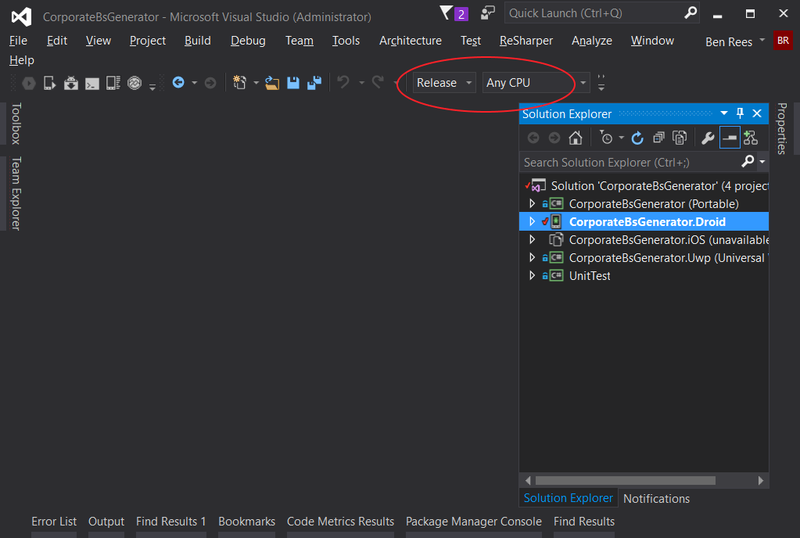 This all works great in Visual Studio. But not in Bitrise (my chosen online mobile build system). Within a few seconds produces this error message. /Library/Frameworks/Mono.framework/Versions/4.4.0/lib/mono/4.5/Microsoft.Common.targets: error : 'OutputPath' property is not set for this project. Usually this is caused by invalid Configuration/Platform combination. Original values: Configuration: PlayStore Platform: AnyCPU. There's been reports of this error on the Xamarin Forums (and here) that include other build system like Jenkins. It looks like there has been bugs in xbuild and Xamarin Studio that have been investigated and fixed. So its no fault of Bitrise. 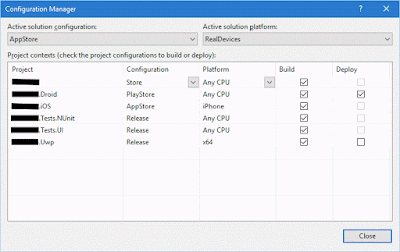 The build is given "AppStore" as the target build config, and "RealDevices" as the platform. The solution file is successfully parsed and based on what we can see from the command line above, it has passed the right target and platform to xbuild (see Store Build Config screenshot above). The iOS project builds fine. It seems unlikely that the bugs discussed in the forum posts mentioned above are still a problem, the posts are dated some time ago. The suggestions center around App code problems rather than real bugs with Xamarin or Mono. xbuild /t:PackageForAndroid /p:Configuration="PlayStore" /p:Platform="AnyCPU" "./XXXXXX/XXXXXXXX.Droid/XXXXXXXX.Droid.csproj" /verbosity:detailed /nologo /p:OutputPath="bin/PlayStore"
This produced the same results, with nothing new of value. Running it locally on a Mac also produced the same results. I then realised that because the build of the Android project is triggered with a build config of "PlayStore" it is passing this value to the its dependency the PCL project. But its supposed to be built in "Store" config according to the solution file. It doesn't have a config in it's csproj file named "PlayStore" hence the error. xbuild is not building the solution in the same was as msbuild, Visual Studio or Xamarin Studio. It is using the Android csproj file as its entry point not the solution file. So the Build Config name provided to build the Android project has to be the same Config name provided to build the PCL. I added a "PlayStore" Build Config to the PCL and bingo. The only downside is that I have two Build Configs to maintain for the PCL: PlayStore and AppStore. I've come across this problem several times with different physical Android devices. This message is thrown when a real production Google Play App with the same App Id has been installed and then you try to install a debug version. 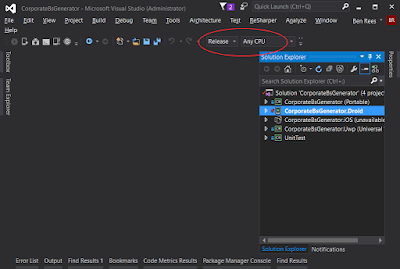 It will happen with any means of deploying a debug version including with Visual Studio, Xamarin Studio, and the command tools. I think what is happening is that Android is not happy with a debug version being deployed over the top of a properly signed and deployed version of a Play Store App. Android stores a flag to block further install attempts for that App Id. When an App deployment attempt is made, the flag that Android created is not reset. To fix this, you will need to reinstall the App from Google Play and then uninstall it normally. 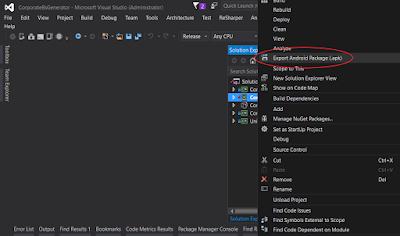 After that you'll be able to debug your App with Visual Studio. This article guides you through creating an APK file for your Xamarin.Android App that is ready to publish on Google Play. Creating an Android APK that is signed and aligned can mostly be achieved with Visual Studio. To sign it and align it, command line tools must be used, but the APK can be created with Visual Studio. You're App does need to be signed to be submitted to Google Play, but it doesn't necessarily need to be "aligned". It is highly recommended however. Its basically a very cheap optimisation that will minimise the amount of RAM your App will need at runtime. Build your Android App in Release Mode. Ensure the platform drop down is set to "Any CPU". This does not automatically occur when you build a Release build. Creating the APK must be triggered manually by selecting a context menu item when you right click the Android Project in Solution Explorer. The APK will be created in your bin\Release\ folder for the Android project. The "signed" file you see in the folder has been automatically signed with a Developer certificate. This isn't suitable for publishing purposes, so you'll need a certificate that identifies you as a developer. Once you have a JKS file you need to keep it in a safe place you must use the same file to sign your App everytime. This file uniquely identifies you as a developer. Replace "my-release-key.jks" with the filename to your JKS file. Replace "my_application.apk" with your app's APK filename. Replace the "alias_name" with the alias name you used when creating your JKS file. You'll also be prompted for the keystore password. Finally use the Zipalign tool to optimise your APK file. This also should be added to your environment path if it isn't already.